A scholarly treatise on the case for American penal reform. Simon (Law/Univ. of California; Governing Through Crime: How the War on Crime Transformed American Democracy and Created a Culture of Fear, 2008) offers an update on the American prison industry and applauds its more recent progression from the inhumanely overpopulated confinement of past decades to what he terms as an “ebbing” evolution toward more dignified treatment of incarcerated individuals. He chronicles prison history back to the 1970s and ’80s—decades of “extreme penology”—and looks at how California, amassing over 150 victims of serial killings throughout that era, became the epicenter of monstrous criminal activity with the only foreseeable solution being extreme incarceration. 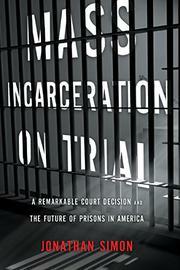 Simon astutely documents the sea change in prison reform simmering throughout the mid-1990s once community activists and prison specialists began rallying against the “unhinged and unchecked” “supermax” prisons fraught with overcrowding and largely dismissed chronic disease and mental illness issues. Significant litigation then sprung up, citing prisoners’ human rights violations against the state of California, supported with disturbing photographs of barbaric conditions. These cases all culminated in the pivotal 2009 case of Coleman-Plata v. Schwarzenegger and the Supreme Court decision in Brown v. Plata, which set population limits on prisons to preserve inmates’ Eighth Amendment rights. With mass incarceration’s attempt at “twentieth-century correctional modernism” and crime deterrence deemed a failure with marked human rights infringements, California was ordered to drastically reduce prison populations with reframed parole programs and, optimally, improved crime-prevention strategies. Simon makes an impassioned plea for prison reform grounded in human dignity, and he leans toward more broad-brush restructuring into smaller and more specialized correctional facilities. A sound, sobering report that’s more educative than eye-opening.